The vast majority of suicide attackers in Iraq are thought to be foreigners — mostly Saudis and other Gulf Arabs — and the trend has become more pronounced this year with North Africans also streaming in to carry out deadly missions, U.S. and Iraqi officials say. The bombers are recruited from Sunni communities, smuggled into Iraq from Syria after receiving religious indoctrination, and then quickly bundled into cars or strapped with explosive vests and sent to their deaths, the officials told The Associated Press. The young men are not so much fighters as human bombs — a relatively small but deadly component of the Iraqi insurgency. "The foreign fighters are the ones that most often are behind the wheel of suicide car bombs, or most often behind any suicide situation," said U.S. Air Force Brig. Gen. Don Alston, spokesman for the Multinational Force in Iraq. Officials have long believed that non-Iraqis infiltrating the country through its porous borders with Syria, Iran and Saudi Arabia were behind most suicide missions, and the wave of bloody strikes in recent months has confirmed that thinking. Authorities have found little evidence that Iraqis have been behind the near-daily stream of suicide attacks over the past six months, U.S. and Iraqi intelligence officials said, speaking on condition of anonymity because of the subject's sensitivity. There have been a few exceptions. On election day Jan. 30, a mentally handicapped Iraqi boy, wearing a suicide vest, attacked a polling station. An attack on a U.S. military mess hall in the northern city of Mosul in December that killed 22 also was believed to have been carried out by an Iraqi, as was a deadly June 11 attack on the heavily guarded Baghdad headquarters of the Interior Ministry's feared Wolf Brigade. Since 2003, less than 10 percent of more than 500 suicide attacks have been carried out by Iraqis, according to one defense official. So far this year, there have been at least 213 suicide attacks — 172 by vehicle and 41 by bombers on foot — according to an AP count. 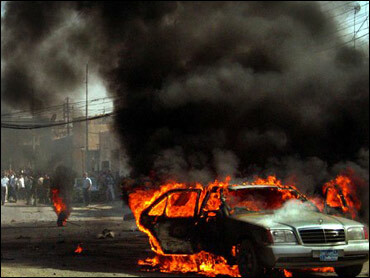 Another U.S. official said American authorities believe Iraqis are beginning to look at suicide bombers as a liability. "Just as there is no shortage of people willing to do this, nor is there any shortage of targets, and they tend to be police," the official said. The trend doesn't mean Iraqis aren't part of the bloody insurgency: On the contrary, Iraqi insurgents are thought to be responsible for much of the violence and fighting in the country, although most of those are non-suicide attacks. "I still think 80 percent of the insurgency, the day to day activity, is Iraqi — the roadside bombings, mortars, direct weapons fire, rifle fire, automatic weapons fire," said Kenneth Katzman, a Middle East expert with the Congressional Research Service, which advises U.S. lawmakers. But he added: "The foreign fighters attract the headlines with the suicide bombings, no question." The key role of foreign fighters in suicide attacks is one reason many senior military officials, including the top U.S. general in the Middle East, tend to view the war in Iraq as slowly developing into an international struggle against militant Islam. The military brass say Islamic extremists like Abu Musab al-Zarqawi and his al Qaeda in Iraq organization are determined to start a civil war in Iraq by attacking Iraqi security forces and members of the country's Shiite majority. "It's not about one man. It's about his network," the top general in the region, U.S. Gen. John Abizaid, said recently. "His network exists inside Iraq. It's connected to al Qaeda. It's got facilitation nodes in Syria. It brings foreign fighters in from Saudi Arabia and from North Africa." One Iraqi official, Sabah Kadhim, an Interior Ministry spokesman, said the suicide attackers' main aim "is to keep the country in chaos." They have managed to do just that. In all, there have been more than 484 car bombings since the U.S. handed sovereignty to the United States one year ago, and the pace of attacks has escalated since Prime Minister Ibrahim al-Jaafari's government was named two months ago. Those attacks alone, mostly car bombs and suicide attacks, have killed about 1,350, according to an AP count. A suicide bomber was responsible for the single deadliest act since the fall of Saddam Hussein two years ago — a Feb. 28 attack against a medical clinic in Hillah, south of Baghdad, that killed 125 people. Al Qaeda claimed responsibility for the attack by a man driving a pickup truck. Another Interior Ministry official, Lt. Col. Ahmed al-Azawi, said some suicide bombers are as young as 15 — and he insisted that none were Iraqis. The foreign militants are believed to come into the country for only a short time before they are sent on a suicide operation, said one senior U.S. military intelligence official in Iraq, who asked not to be named for security reasons. "They are brought in, there is a lot of indoctrination that is forced on them here and they are moved very rapidly into a mission to deliver the bomb to commit suicide," the official said. A U.S. official in Washington shared that assessment. Overall, the number of foreign fighters coming into the country seems to be on the rise, compared to six months ago, Abizaid said. "There's probably about 1,000 foreign fighters and about somewhere less than 10,000 committed insurgents in the field," he said. Of the 10,000 people being detained in Iraq, about 400 are foreigners, the U.S. military says. The majority of foreign bombers in Iraq are believed to come from countries in the Persian Gulf, mainly Saudi Arabia and Yemen as well as Jordan, U.S. officials say. They say many are transported to Syria and then smuggled into Iraq, mostly overland through Qaim — a frontier city in Iraq's western desert. U.S. Marines taking part in a major operation around Qaim on June 20 found foreign passports and one roundtrip air ticket from Tripoli, Libya, to Damascus, Syria. They also found two passports from Sudan, two from Saudi Arabia, two from Libya, two from Algeria and one from Tunisia. Up to 20 percent of the bombers might be from Algeria, according to forensic investigations after attacks, senior U.S. military officials have said on condition they not be named for security reasons. Another 5 percent each might be from Morocco and Tunisia, the officials said. "We've also seen an influx of suicide bombers from North Africa, specifically Algeria, Tunisia and Morocco," Abizaid said. Robert Baer, a CIA officer from 1976 to 1997 who spent the much of his career in the Middle East, recently returned to the region for a month to study suicide bombers as part of an investigation for Britain's Channel 4. His trip included a 10-day visit to predominantly Shiite Iran. Baer said Sunni Arabs who take carry out suicide attacks feel Shiites are attacking Sunnis in Iraq. "They look at the war in Iraq as an attack on Sunni Islam, not Iraq, not Saddam," he said. In interviews while visiting prisons, terror groups and government officials, he was told that there are so many suicide bombers coming out of the Persian Gulf states that the loose networks that deploy jihadist martyrs — many run through mosques — are turning away potential attackers. He said the mentality is: "They have taken what is ours and they will take more if we don't stop them."